Tolu Ogunlesi: Pharmacist, journalist, photographer, social networker, poet and fiction writer. Not sure there’s much more I can say about myself, beyond listing those dry facts. I guess other people should be the judge. GV: How come it suddenly became a fad to tweet, chat or share insight and information on Facebook about the 2011 elections in Nigeria? TO: I think that since social networking has become a significant part of the lives of a steadily increasing numbers of Nigerians (an estimated two million Nigerians are on Facebook; admittedly a tiny number when compared to the total population), there was no way elections were going to take place without the process playing out on Facebook and Twitter. Also, a move like President Jonathan’s decision to join Facebook helped in the ‘faddification’ of social networking. In a country long ruled by inaccessible Big Men, it was a startling revelation to realise we could ‘interact’ with the President on Facebook. GV: Did social media break any new grounds during the campaigns? 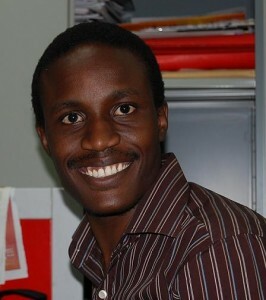 Tolu Ogunlesi. Photo courtesy of Ifeyinwa Uzowulu. TO: Definitely. President Jonathan took the shine off the IBB [Ibrahim Babangida] presidential declaration in Abuja by choosing that morning to announce his own bid on Facebook. Ibrahim Babangida launched a YouTube campaign video, and had an aide boast that he had become an avid Facebooker. GV: What was its role in the making voters choose a candidate? Specific reference to the numerous online polls for the presidential contenders? TO: We must acknowledge that only a limited population of Nigeria uses social networking. While I’m not trying to limit the efficacy of social networking to the online population, what this means is that online polls may not be a fair measure of elective potential, considering that the online polls audience is very likely to be young, reasonably educated and middle-class – characteristics that are not very accurately representative of the total voting population. GV: Most Nigerians still rely on traditional media (especially radio) for election news. Do you think social media can ever beat old media as the primary source of information for elections in Nigeria? TO: I refuse to see it as a contest between traditional and new media. I’m more interested in seeing the ways in which old and new converge and connect and reinforce one another. I’m interested in studying how tweets and Blackberry messages make it onto radio and become potential news sources (e.g. traffic reports). Piers Morgan recently tweeted that he learnt about Osama’s death from Twitter (a “random tweeter” in his words). He then raised an interesting question about the concept of “primary” news sources. GV: Opinion leaders are also major agents of voting behavior in Nigeria. Does new media have any chance of ever influencing the voters at the grassroots? TO: Well, on the one hand we need a more literate and better educated population before we can begin to see that kind of real direct influence. On the other hand, new media can influence grassroots voters through the mediation of traditional media (radio, television), as I explained earlier with the case of traffic reports. GV: Which of the numerous new media had the most influence on online Nigeria Decides 2011? – Twitter, Facebook, Blogs, LinkedIn, etc. and why? TO: I have no statistics at hand, so its hard to tell. Secondly, I have a Twitter-bias, so I may not be the most objective judge of this. But then, I think that Twitter manages to avoid a lot of the clutter of Facebook, and characteristics like #hashtags and Trending Topics make it easier to isolate trends and aggregate/isolate valuable information. GV: Do you foresee any future for the cyber-warriors of Nigeria Decides: RSVP (Register, Select, Vote, Protect Campaign), Reclaim Naija, EiE Nigeria etc. TO: Definitely. The work has just started. It’d be a mistake to think #NigeriaDecided. The truth is that Nigeria is still deciding. We need to move into the next phase, which will involve holding our elected and appointed officials accountable, as well as fine-tuning the strategies that have been deployed during the just-concluded elections, so that the 2015 engagement can be even more successful. GV: Finally, do you think that social media really influenced the Nigerian elections? Or was it mere hype? TO: It played a part. It helped to fire up a significant number of young(er) Nigerians. It made electoral awareness seem cool, just like it did in the United States in 2008.